The inaugural edition of the RuPay Pro Volleyball League 2019 came to an end after a spell of thrilling volleyball action over a course of twenty days from 2nd to 22nd February 2019. The league was the brainchild from the joint initiative or the Volleyball Federation of India and Baseline Ventures. 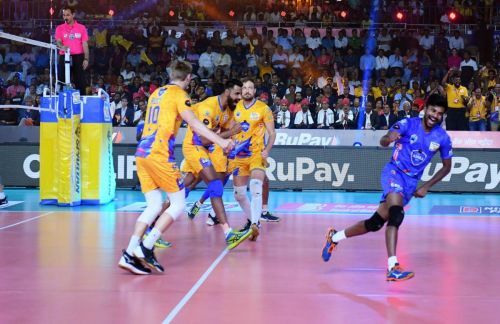 Chennai Spartans emerged as the champions of the RuPay Pro Volleyball League 2019, overcoming the Calicut Heroes in a dominating victory in front of their home crowd in Chennai. The Spartans won 3-0 (15-11, 15-12, 16-14) crushing the undefeated Calicut Heroes in a strong all-around performance. The RuPay Pro Volleyball League tweaked the rules of volleyball to make it more interesting for the fans and it most definitely worked. Every set in the inaugural edition of the league was of 15 points, unlike the conventional 25-point set in international volleyball. This made the sets smaller, switching the game into a faster gear and making it exciting to watch. Here's how @KBS_VC won the @PeterEngland_ Super Point in the first set courtesy of a brilliant spike from Prabagaran. The league also introduced concepts like Super Point and Super Serve to help the teams win more points at critical junctures. Each ace served was awarded two points to the serving team, called as Super Serve. The teams also got a chance to win two points in one by calling in a Super Point in every set.